Windows not responding? Can't get online? Emails refusing to send? Give us a call to ease the frustration of PC problems. We have been repairing PC's and laptops since 1998 and have experience with all versions of Windows. Viruses and spyware are becoming one of the biggest problems with PC's, we always recommend Kaspersky to keep you safe when banking and shopping online. If your computer is refusing to 'boot-up', or has decided it doesn't want to connect to the internet, let us take a look at it for you. We can make sure the hardware is physically OK, check windows is functioning properly and also test its security. My laptop is 'good as new' new now after being serviced. Kaspersky was installed and since then it has been running like an oiled watch. Will definitely have this done again next year. 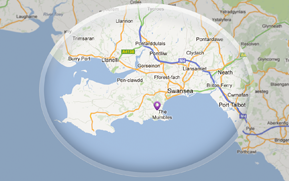 We cover a wide area including the Gower, Swansea, Llanelli, Neath and Port Talbot.